I've been looking forward to driving this "big" Fiat since I heard it was coming to our shores. It is quite a bit bigger than the Fiat 500, for sure. 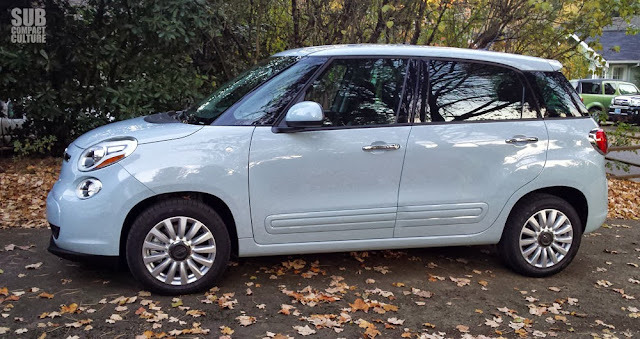 As a friend said, perhaps it might have been better called the Fiat 600, but so be it. Initially, I think this is a homely little beast, but maybe it'll grow on me; I felt the same way about the Nissan Juke. Although those wheels look really small, they're actually 16s. The exterior proportions are odd. In fact, the whole thing is a bit odd looking. Plus, what's up with that color? Is it blue? Is it gray? Is it white? Technically, it's "Blu Chiaro," or light blue. I'm not feeling it. The interior, however, is pretty awesome. The seats feel like they have a neoprene cover, but it works. This thing is cavernous on the inside, and it's super practical. I can't help but love it. And—woo hoo!—it's a six-speed manual. It is powered by the 1.4-liter turbo MultiAir engine. It's got notable turbo lag, and you do have to keep it in the powerband to make it scoot. The car does have decent thrust in the powerband. It handles better than you'd expect, too. Looks like a 500 and an 80's Chrysler mini van had a one night stand.